Slice the zucchinis in half. De-seed & cut the capsicum into segments. 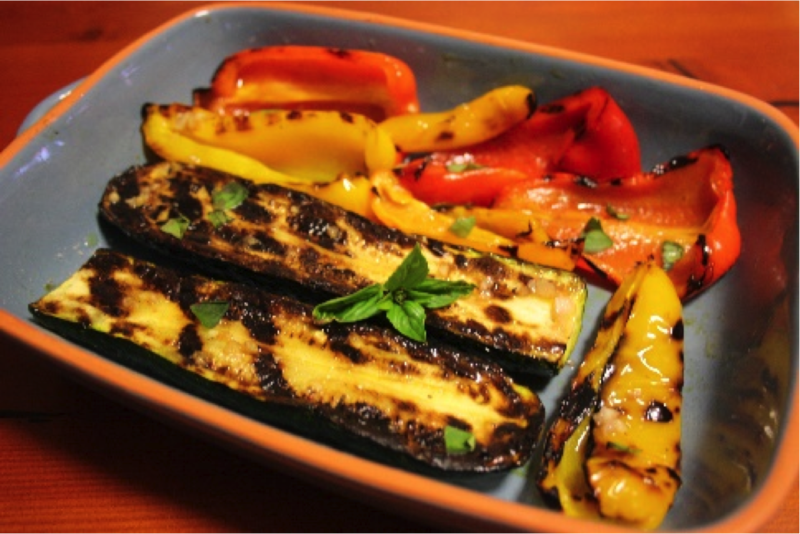 Brush them with a little olive oil before placing them onto the grill plate on the bbq or into a thick based fry-pan. Make sure you pre-heat the bbq/ fry-pan. Cook these for a few minutes each side, until just tender. Turn the heat down if you need to so they don’t burn. Take off the heat and place in a shallow dish with a little salt sprinkled over the top and set aside. Now for the dressing. Whisk together all the ingredients in a small bowl and pour over the capsicum & zucchini. Final touch is to sprinkle over a few torn basil leaves. Allow this to sit for a least an hour before serving. They’ll keep for a week in the fridge tightly covered, but may not last that long. They didn’t in my house anyway. Super tasty and very moreish! Great side dish to serve with grilled fish or chicken or to have on their own.